I like to consider myself something of a suicide whisperer. I don’t really have the chops to be a researcher or the patience to be a clinician, but I often find myself in new territories, listening to people share their insights about living through unimaginable suffering. Then I look to connect partners much smarter than I who can make a difference in alleviating that despair. So, as I am listening, I think to myself, “there are the stories I wish we would talk about more.” Note, none of these observations have tremendous research about them, just observations heard over 13 years of listening. My hope is that together we can lift up new narratives, new research agendas and new clinical practices that are informed by diverse journeys through suffering and recovery. I know I am not the only one thinking about these things, but I don’t think these stories are part of our mainstream narrative in suicide prevention or suicide grief support. I am interested to hear your thoughts. 1. For many people living through suicidal intensity is a spiritual journey. Faith communities and mental health providers often work in silos, but for many people our mental and spiritual wellness are incredibly intertwined. For some this means turning to a tradition of faith and religious scripture to find a path toward healing. For others a spiritual awakening is a profound connection to something larger than themselves and happens in our darkest hours. Often times the drivers to suicidal despair are not the result of a mental health crisis but are about a profound disconnect to purpose that a spiritual path may be better suited to reconnect. Over and over again, I have heard this narrative — when people are in the depths of suicide grief or hopelessness — that they felt a calling or comfort they could not fully explain that kept them going. This connection to the mystery and the interconnectedness to our past, present and future can be a powerful force that helps us make meaning. What are the stories from our spiritual healers and those who turn to spiritual practices to find strength? Some people go through an acute period of suicidality in the face of a personal crisis. When the crisis resolves, the suicidal thoughts and feelings dissipate. Others find suicidal intensity comes in and out of their lives when they hit difficult patches or for no identifiable reason they can determine. For others, suicide is an option that is always percolating. For people who always have “suicide on the menu,” sometimes they tell others, many times they don’t. Sometimes these chronic suicidal thoughts are part of a way people manage emotions and interpersonal relationships, and sometimes they are not. Most of our suicide prevention tactics — gatekeeper training, reducing access to lethal means, involuntary holds, and such — are often implemented with the acutely suicidal person in mind, not the chronically suicidal person. As Jess Stohlmann-Rainey recently wrote, we have created a social norm narrative where we have “good” and “bad” stories of surviving suicidal experiences. “Good” being that the person found treatment in the midst of the crisis and was “cured.” “Bad” being that the person was challenged to find something that helped and continued to have suicidal thoughts. This statement is an example of thought processes many live with daily. Because of intense reactive fear most in the general public have about suicidal thoughts, many don’t always know how to respond to people who have chronic ideation. People living with these thoughts in turn are also afraid to share their thoughts with us for fear of a reactive and often punishing response. So these stories are often not told. As the suicide prevention community has started to lift up the voices of lived experience, many people are experiencing pressure to conform to the “good” narrative and say something like, “oh yes, I had suicidal thoughts as a young person, but no longer” when the truth is suicide is still an option for them. One such colleague, a highly esteemed leader in the healthcare industry said to me, “I call bullsh*t on this.” She was frustrated that few were legitimizing the fact that many people live fully functional and highly successful lives while having a never ending tape of suicidal thoughts playing in the background. She went on to explain that for her and many others, suicidal thoughts play a constant role in their lives, and she and many others have found effective ways at managing them. Can we lift up more stories of how people cope with chronic suicidal thoughts — not just in the crisis moments, but every day? 3. For many people suicidal intensity can be a turning point of transformation. Sometimes coming so close to death is the catalyst that helps people find better ways of living. Often we are so focused on “suicide risk management” after a suicide attempt, we neglect to help people process the growth that can result. For many attempting suicide is a traumatic experience, one that can lead to the avoidance, hyper-arousal, intrusive experiences, and numbing like any other traumatic experience. We also know that traumatic experiences, especially near-death experiences, can give people a renewed perspective on living. When facing death people can find themselves more closely connected to loved ones, passions, causes, and a higher calling. In addition to stories of how outside intervention helped people turn their lives around, can we also lift up more stories on the internal transformation people experience in the aftermath of a suicide crisis? 4. Not everyone who survives a suicide attempt is relieved to be alive. While some people self-rescue in the middle of a suicide attempt, and others are grateful that they were rescued by others, some people wake up angry to be alive or feel like they have failed yet again. If we are really intent on understanding the full spectrum of experiences with suicide, we need to pay attention to these stories as well. Do they have a different path post-attempt than those who are thankful for another chance at life? Can we be open to listening to a wide range of stories to fully understand a diverse spectrum of experiences through suicide intensity and suicide grief? 5. Sometimes “reasons for living” are not future-oriented but speak to legacy. One theme I have heard many times, especially from fathers who have experienced suicidal thoughts, is this idea of legacy. It wasn’t so much that they wanted to stay because they felt needed or had future hopes for themselves; they stayed because they didn’t want suicide to be how they were remembered by their children. I think this is a slightly different twist on some of the usual “reasons for living” we explore and may warrant more investigation, but I’ve heard it enough times to think there is something there that might have therapeutic value. What is the meaning of legacy in people’s narrative of their lives, and how does this play in to suicide prevention? 6. Compassion for coping with suicide can come from unusual places. Everyday clinicians, first responders, peer supporters, and crisis call counselors are saving lives by offering empathy and helping people make plans for safety and wellness. I am also interested in the heroes who step into the space of suicide prevention or suicide grief support that surprise us and bring us new stories of how everyday people can make a difference. For me, it was the woman behind the post office counter. Just days after my brother Carson died of suicide, we were at the post office picking up Christmas gifts that people had sent before his death. I must’ve looked very distressed during our exchange, because the postal worker asked me if I was okay. When I explained to her what had happened, she didn’t miss a beat and offered eloquent words of support. I called her my angel. Sometimes influential guides on our journey through despair and grief are those we never expect. How can we lift up the stories of these everyday heroes? 7. Social determinants to suicide exist and mental health support is not the only way to living through suicidal intensity. The June CDC report “Suicide rates rising across the US” shared what many of us have been thinking for a while: suicide is not only about mental health. Sometimes suicidal despair is the result of discrimination and marginalization — outside social forces that will not be changed with antidepressants and cognitive behavioral therapy. Sometimes the main driver for despair is an economic change and the “cure” is employment. What are the stories of finding hope through non-mental health interventions? 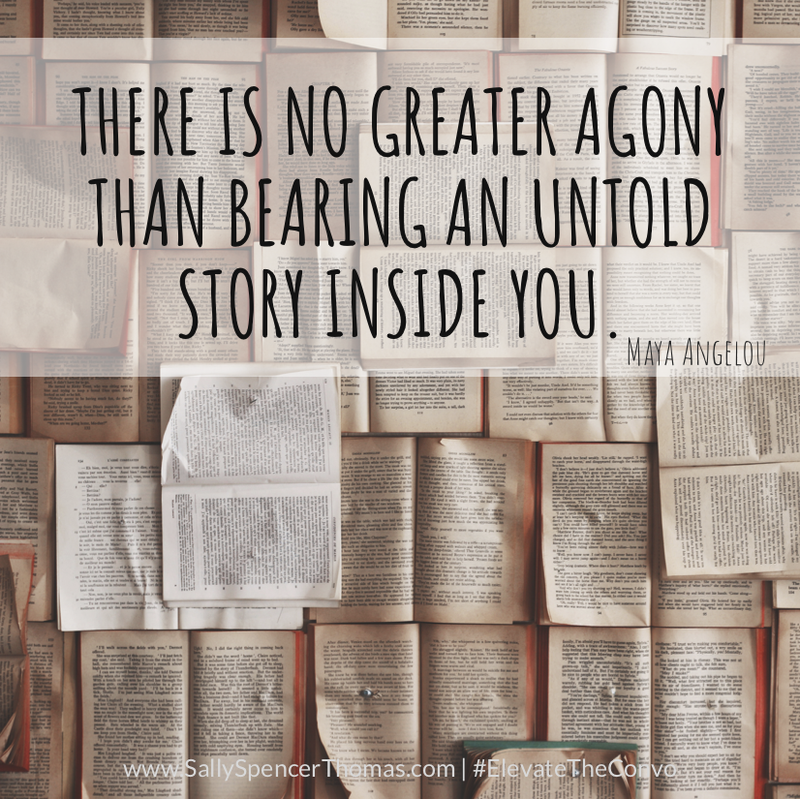 As someone who strongly believes in the power of stories to change culture, I am interested to hear your thoughts on how these and other untold stories can be told. What are the stories we are NOT sharing that help us more fully appreciate the human experience of suicide and may give us new insights into prevention and grief support?